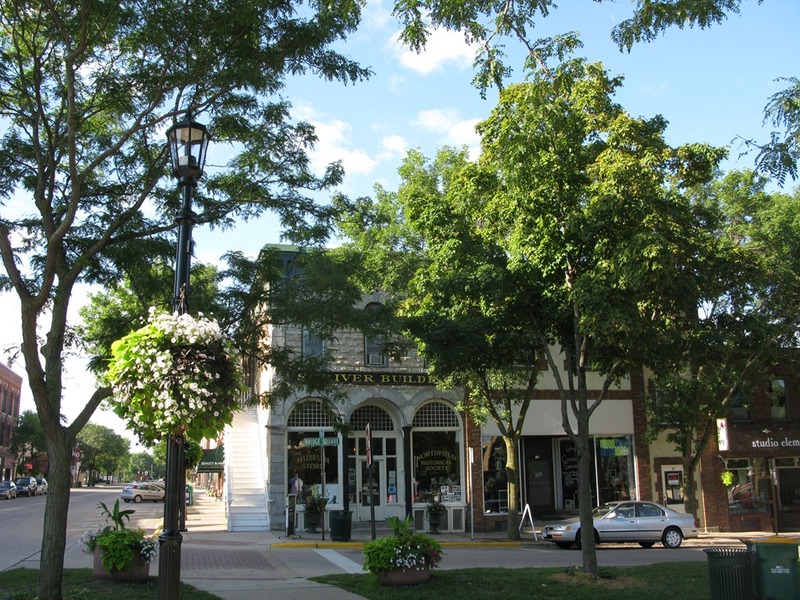 The Northfield Historical Society is recommending that the two ash trees (see photo above with red arrows) in front of the Scriver Building (its headquarters and museum) be removed. NHS is initiating a project to increase the accessibility of the Scriver Building by installing an elevator in the alley behind the stair tower that opens onto Bridge Square. The elevator will provide ADA access to all three levels of the building. Currently the accessible entrance to the building is off of Division Street. However, this enters into the Museum proper and does not allow access to other floors of the building. To make the elevator ADA accessible they are proposing to use half of the sidewalk in front of the building to construct a ramp to allow access to the elevator from the stair well. Other options were explored but were not feasible due to physical constraints of the building. Drawings showing the proposal are attached. Currently the sidewalk in this location is about 12 feet wide. The proposed improvements would use 5-6 feet of this width leaving 6-7 feet for the pedestrian access route if additional width for pedestrians is not provided. Here are six more photos of the area in front of the Scriver Building. I’m trying to understand the rationale for the removal of the trees since ADA standards would still be met after the ramp was built. Previous PostNorthfield in Bloom: not just flowers anymoreNext PostSand needed in brick paver crosswalks downtown: how to tell the city about it? The ADA accessibility issue is twofold here, one is to access the building and the new elevator inside. The other is for free passage on the sidewalk for those continuing down to the Post Office or the river. 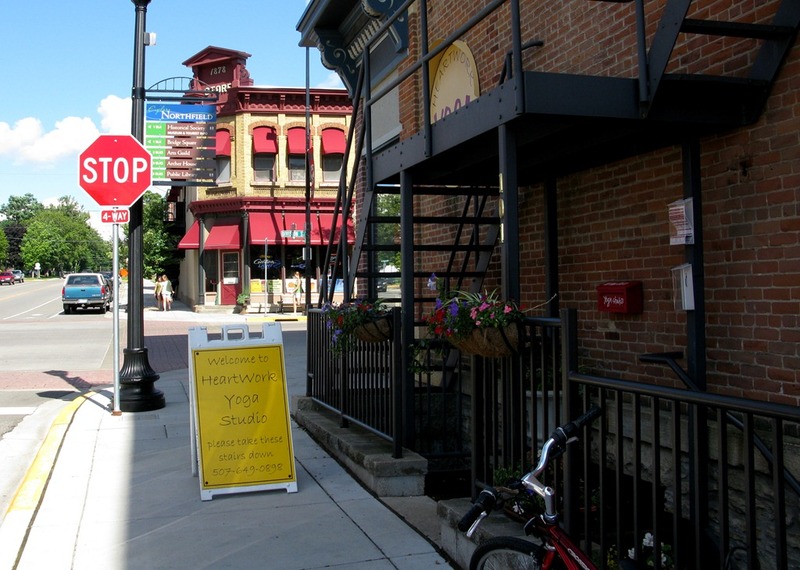 The similar situation can be seen one block to the south at the Holland Block where access to the basement yoga studio and to Enrique’s Salon is by steps that are out into the R.O.W sidewalk. There is adequate space for passage next to these steps but there are no trees at on this stretch of sidewalk. Given that the green space of Bridge Square is very near to the Scriver Building, there are sizeable trees that are quite close to the building – a significantly different situation than the recent 4th Street discussion where there would have been no trees between Division and Washington between the buildings fronting onto 4th St.
Steve, I’ve added a photo of the access siutation for the Holland Block at 5th and Division that you mentioned. What’s the width of the sidewalks in both locations? Thanks for the picture Griff. 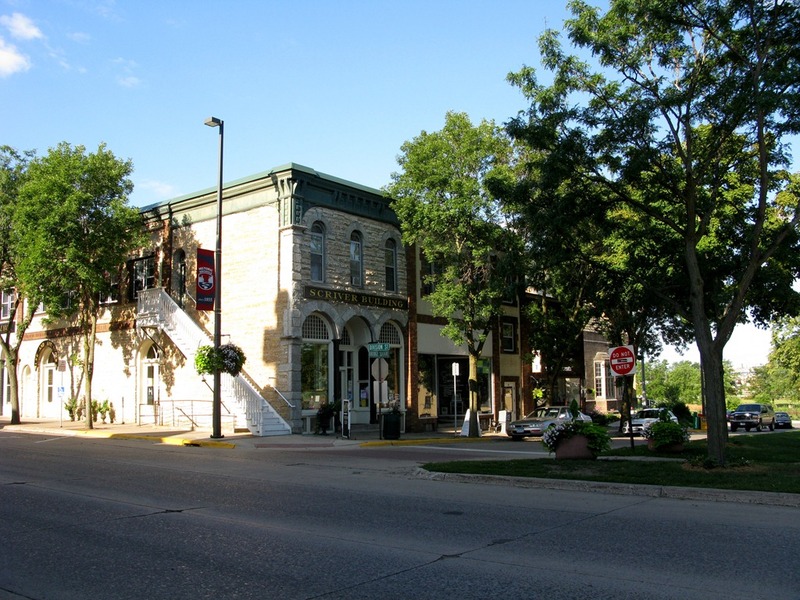 The overall sidewalk in front of the Scriver Building is about 12 feet with roughly 5 feet anticipated for the access to the building leaving seven feet for the sidewalk along the curb. At the Holland Block, the stairs take up 5 feet of width and the sidewalk along the curb is 7 feet 6 inches +/-, so roughly comparable dimensions. Steve, can you point to a document/sketch that shows where the access infrastructure would go in relation to where the trees currently are? I ask because ADA doesn’t require ‘free passage’ for two wheelchairs to be continuous, only that they be able to pass each other every 200 ft. So “pinch points” of 48 inches to accommodate a single wheelchair are fine. Griff, about all I can say on your point is that the City Engineer’s position was that the seven feet was not enough for the trees and grates to comply with the ADA requirements, so I think it is more that even the 48 inches is difficult to achieve with the tree grates and the revised building access. 1. I don’t see why the tree grate is a problem. It can be made flat or replaced with something that’s level with the grade. 2. You don’t really need a full 5 ft for your ramp, do you? The wheelchair ramp at the Armory is 48 inches wide with a few inches on each side for the concrete curbing which you wouldn’t need. The Americans with Disabilities Act of 1990 mandates the establishment of minimum walkway clearance widths and there are variety of organizations that offer sidewalk width recommendations. Updated and revised in 2004, the Americans with Disabilities Act (ADA) and the Architectural Barriers Act (ABA) Accessibility Guidelines for Buildings and Facilities state that walking surfaces should have a clear width minimum of 36 inches. This clear width minimum is the minimum width for passage and not a sidewalk width recommendation. The clear width is the width of section of the walkway that is completely free of obstacles, vertical obstructions and protruding objects. The 36 inch width is the minimum width required to provide sufficient space for a person who uses mobility aids to travel within the restricted space. However, restricting the pedestrian zone to 36 inches prevents passing and does not allow for 2-way travel. 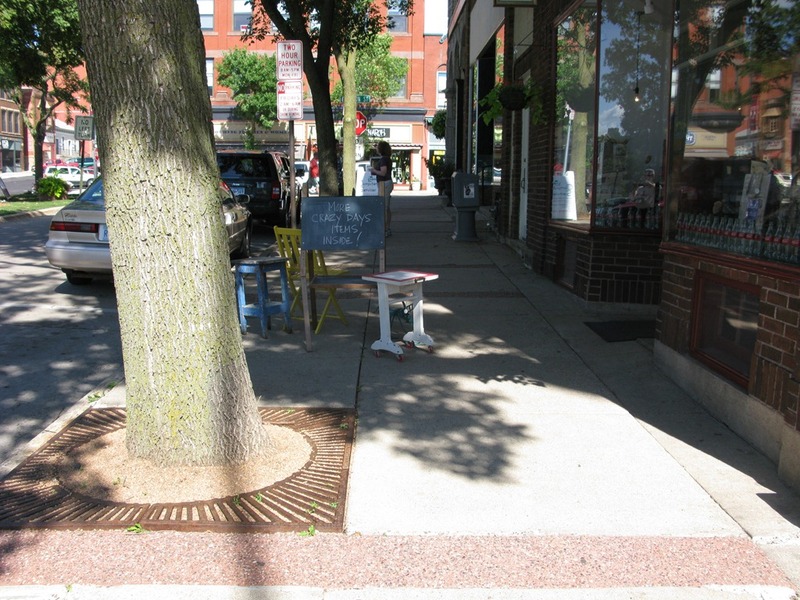 The ADA and ABA guidelines state that where sidewalks are less than five feet in width, passing spaces sufficiently wide enough for wheelchair users to pass one another or to turn around shall be provided at intervals of 200 feet. For more details visit ADA-ABA Accessibility Guidelines for Buildings and Facilities and the Accessible Rights-of-Way: A Design Guide. Hayes: Can you tell us the cost of making the building ADA accessible and perhaps a breakdown of that cost. Much appreciate it. Griff, we haven’t fully designed the “ramp” yet but we may well need 5 feet for it. There is the issue of legal minimum dimensions and what is hospitable to allow for people to actually use spaces, especially at doors. As for the grates and the city sidewalk, that is really outside of my area as the City Engineer and Planner have the call there. Aside from the dimensions and numbers, though, the bigger issue that I think you are after, is should these two trees stay or go. 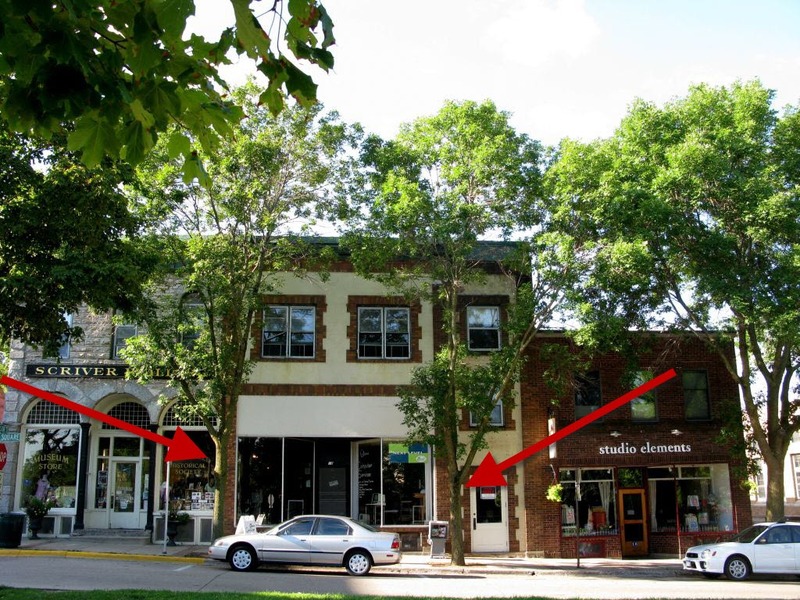 Part of the Council discussion was that providing better access to our historic downtown buildings is a vital concern for the social and economic health of downtown and that in this case two trees might well be worth sacrificing for these gains. There was also discussion about the idea of planting new trees elsewhere to offset the the loss of these two. In trying to balance all of these issues, the difficulty of enhancing one aspect of the downtown (access) is running into another aspect (trees). I am for both of these as they both contribute to a healthy and vital downtown, however, in this case I concur with 6 of the 7 councilors that the access benefit outweighs the tree benefit, especially with the numerous trees in Bridge Square. As for the tree issue, I think Steve has outline the discussions that we have had with the City very well and that is the path we have gone with. In addition, as Griff and I chatted about a few days ago. The two tress that are slated to be cut down have been damaging the Scriver Building for many years as well. About two years ago, the City had to come out and trim the trees. I am guessing either later this year or next year if the trees were to stay they will need to be trimmed back again. I am planning on doing a blog post on the NHS site to outline the project and put up the schematic designs for the project so everyone can see them. Gee Hayes… anyone who has trees next to a house has to routinely trim them away from the roof, they should never get to the point of damage. I think it is really sad to take down beautiful big thriving shade trees in the downtown district. Seems a little short sighted. 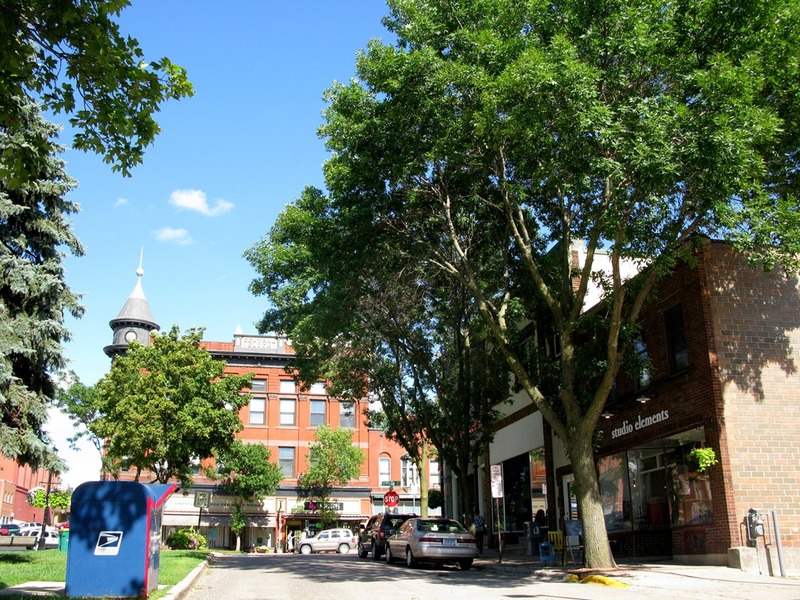 The trees soften the downtown landscape and especially as you look down the street from the North and see the bend … those trees keep it from looking stark. It really is one of the few place in town where there is a old established shade tree look. I’ve added a straw poll on the trees. See the upper left sidebar. Hayes: Many thanks for the ADA costs, almost $750,000. I assume that additional to this is the remodelling of the second floor etc, at a total cost of, say, $1,000,000 to make this wonderful, ancient, iconic, historic, downtown building more efficient, functional, expanded in its use, and fully wheelchair accessible…? * how nicely the two trees frame and accentuate the beauty of the Scriver Bldg. 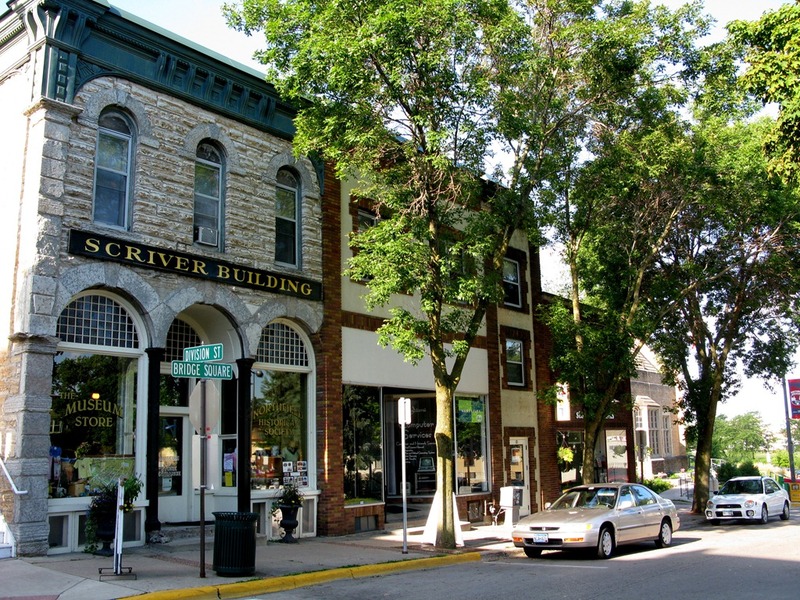 * how easy it is to see the beauty of the Scriver Bldg from several angles. Imagine how barren it will look without those two trees. Mr. Scriven, don’t tear down those trees! 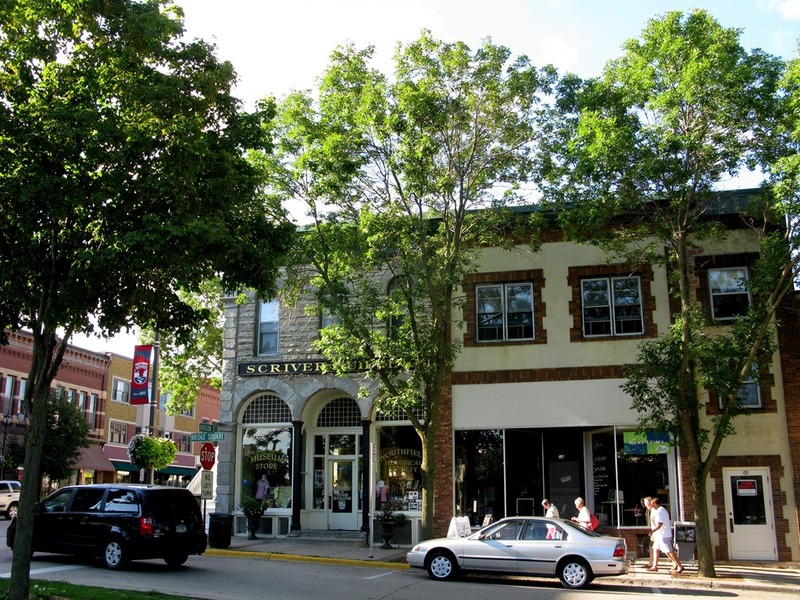 An element of ADA accessibility, which includes maintaining proper sidewalk width, required the removal of two trees in front of the Scriver Building. And from a construction standpoint, by providing this “ramping” on the outside of the building we do not have to do it inside. This will help maintain the historical nature of the Scriver Building and allow us to install six ADA-compliant restrooms (see No. 3, below).